To include or remove folders from librarys in Windows 7 please start the MS-Explorer with keys [Win-Logo]+[E]. Right-click at the library you want to customize (add or remove folder) and then click "Properties" (Image-1). Then you can see the "Properties" (Image-2) of the selected library. Click the button "Include a folder" to add a folder to the selected library. Pick an existing folder and click the button "Remove" to remove a folder from library. You can include in a library, a folder from an external hard drive, from removable media devices (such as CDs and DVDs) and also from a network folder. When you no longer need to monitor a folder in a library, you can remove it. 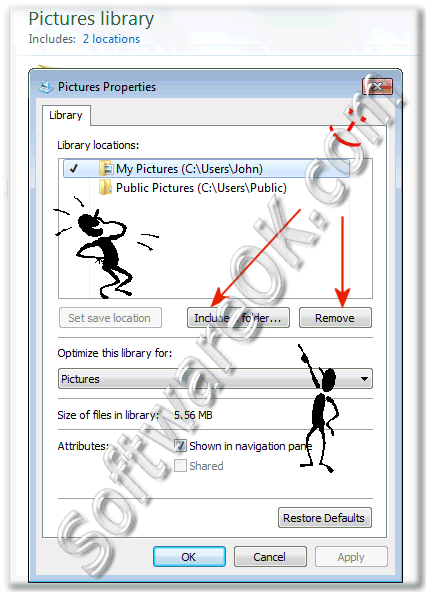 When you remove a folder from a library, the folder and its contents are not deleted from their original location. A library gathers content from various folders. You can include folders from different locations in the same library, and then view and arrange the files in those folders as one collection. For example, if you keep some of your pictures on an external hard drive, you can include a folder from that hard drive in your Pictures library, and then access that folder's files in your Pictures library whenever the hard drive is connected to your computer. Windows-7 - FAQ-36: How to include or Remove folders in a library on Windows 7? Do not include in library windows 7? How to extract music from window 7 library to external hard? Removing folders from windows media library? How to include folders in library? How to add or remove folders in a library windows 7? add and remove folders in library? windows7 remove include in library? remove folder from folder windows? include folders in library in microsoft windows 7? how do i delete picture folders on the windows 7 phone? ow to include in library? how to add and remove folders in a library? how can I add or remove folders in a windows library? Windows 7 library remove included folder? Windows remove folders from library? Remove the folder pictures in windows 7? How can i add or remove folders in a library? Undo include owner in library windows? Windows 7 how include folder in a library? Include folders in a library command? 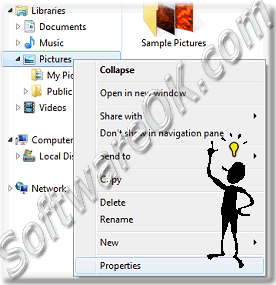 How to delete a folder in the video library windows 7? How do you delete photo library windows 7? Windows 7 include a folder? Windows 7 library includes missing? Delete a library directory windows 7? How to delete folders from windows 7 libraries? Remove folder from library win7? Win7 remove drive from library? Add and remove folders in a library? Win7 explorer include in library? How to include in library? Windows 7 include folder in library remove? Windows 7 remove folder from library? Remove files library windows 7? Delete images library win 7? Including a folder in Windows picture library? Are libraries included in windows 9? Can files be included in libraries? Windows 7 home basic add network folder to library? How to add or remove folders in a library? Remove folder from folder windows in a library? How can i add or remove folders in a library in windows 7? pictures library windows remove properties? Remove folder library windows 7? Windows 7 include in library? Delete folders from library in Windows 7? Remove folder from win7 library? How can remove item add library in win 7? Remove folder from pictures library? Vbs include folder in library win7? How can i include desktop in my library? Want to remove pictures folder from system? What to include in library window 7 ?